When Tots100 and Boots challenged me and other parent bloggers to post our favourite baby photo, I really had to think about if I was up to the challenge. Having four children, I have lots of baby photos and I love and treasure every single one. For me, they are not just printed pixels of colour, but a reminder of special times and memories. There is a story, far longer than any blog post I could write, behind every photo. Looking through old baby photos can bring me right back to that precious time in my child’s life and enable me to experience all those wonderful emotions again. I treasured Danny’s very first baby photo, I kept it with me at all times, while he lay in SCBU. I used to look at his photo and think about him while I expressed his milk, until he was well enough to feed from me himself. Rebecca’s baby photos are beautiful. I especially love the photos of Danny meeting his little sister for the first time. The sibling love that shines through truly takes my breath away. Caitlyn’s photos were very important to our friends and family. She was a surprise baby and everyone needed to see the photos to believe it for themselves! Then of course, Isabelle’s baby photos are still new and fresh to us. Even at her young age, it is a treat to look back at past photos and see how tiny she was not so long ago! I have so many favourite baby photos, so to keep it fair and so I don’t have to choose between my children, I am going to choose my most recent favourite one. Here is Isabelle on a trip to Manor Park recently. She had been watching her older siblings play in the Autumn leaves. 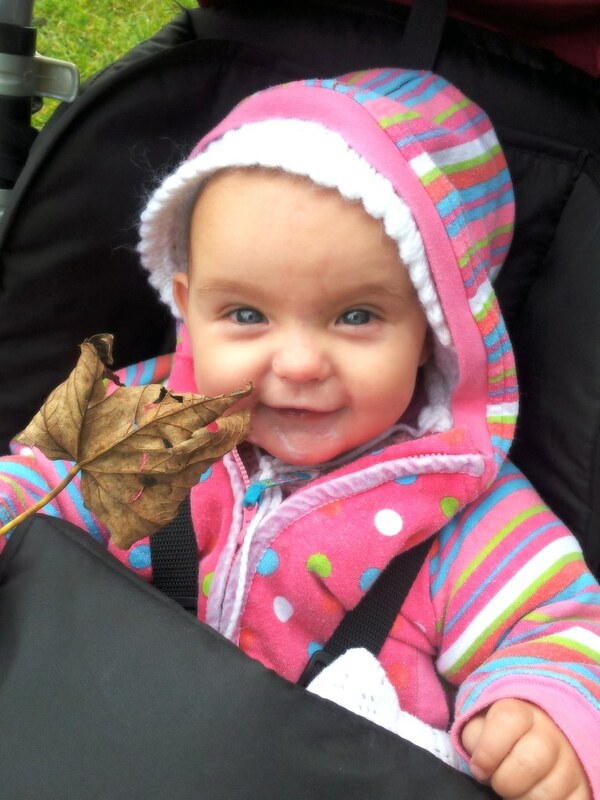 She was delighted when Caitlyn gave her a leaf of her own to hold. I love her smile and the fact that a simple act of kindness from her sister caused it. I also prefer the natural photos that I have of my children, than the studio ones. What are your favourite baby photos? Previous Post Well done, Danny!